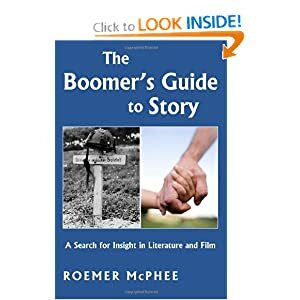 Roemer McPhee’s The Boomer’s Guide to Story delves into the ideas and insights that are shaping the future of modern storytelling—and cinema as well. Readers of The Boomer’s Guide will enjoy an opportunity to take a trip down memory lane and celebrate the most visionary stories ever put to paper. Stories, suggests McPhee, are imbued with timeless themes that dissect the human element and reflect the philosophy of life, a major reason that certain texts transition seamlessly into society. Though The Boomer’s Guide to Story consists of roughly three hundred classic novels, it should not be mistaken for a basic review of each text. On the contrary, the audience is in for a pleasant surprise as McPhee digs deep into the most profound novels of the modern era—with few exceptions—and finds an entertaining way to deliver the information via a behind-the-scenes, snapshot approach that will aid readers in remembering the innovative and timeless nature of storytelling—and show readers how to look at literature and cinema from a different angle. In the process, writers will be given the prolonged, but well deserved, recognition for the ideas that turned their stories into some of Hollywood’s biggest blockbuster films. Get ready to come face-to-face with the terrifying story, Alien, in outer space and grapple with Norman Bates in Alfred Hitchcock’s Psycho. What makes The Boomer’s Guide to Story special is not that it can present a plot summary of the films that put Hollywood on the map; conversely, McPhee’s text is unique because it takes a story a step further, exploring how it’s ideas provide insights into humanity and life as a whole. This book was an amazing resource. The book is both well written and informative and provides the reader with insights into so many movies! All you have to do is open the book to any page and I am sure that you will gain a new appreciation for any movie listed within this book. What I loved most about this book was that the author has taken well known movies and has made them again unknown to readers. He has placed the spark back into the movie and is opening eyes left and right. I shared this book with my wife and even she was amazed at the in-depth nature of the book and clear insights that the author provides. If you are a movie-lover, this book is a must read, as you will leave it with a better understanding and love for the movies around you!